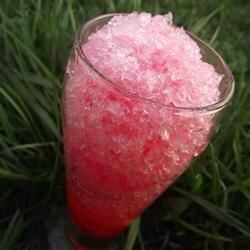 "Flavored Syrup to drizzle over shaved or crushed ice. Yummy on a hot summer day." In a saucepan, stir together the sugar and water. Bring to a boil, and boil for about 1 minute. Remove from heat, and stir in the drink mix. Allow to cool, and store in a container for pouring. Pour over shaved ice to flavor.